So what if the income from her family’s 1 bigha of land, sale of milk of their sole buffalo and her mother’s sporadic earnings (as a farm and construction laborer) almost always falls short of keeping the hearth burning, so what if Razia has had to go hungry many a times, so what if she has to work alongside her mother to supplement the meagre family finances, so what if she has to do all household chores along with attending school, so what if she has to study under candle light as there is no electricity in the house, so what…. the list is endless. But for Razia, all this is a small price to pay for what she has got in return—the gift of education. Razia studied till Class 5 in her village primary school. After that her mother and brothers said there was no need for her to study any more. But Rehana Rehman of NBSKS came to her rescue. She was known to Razia’s parents as she had earlier helped them get a buffalo under some government scheme for BPL (below poverty line) cardholders. She explained to Razia’s mother the importance of education for girls and managed to get her consent for Razia to continue with her studies in an upper primary school of a nearby village. 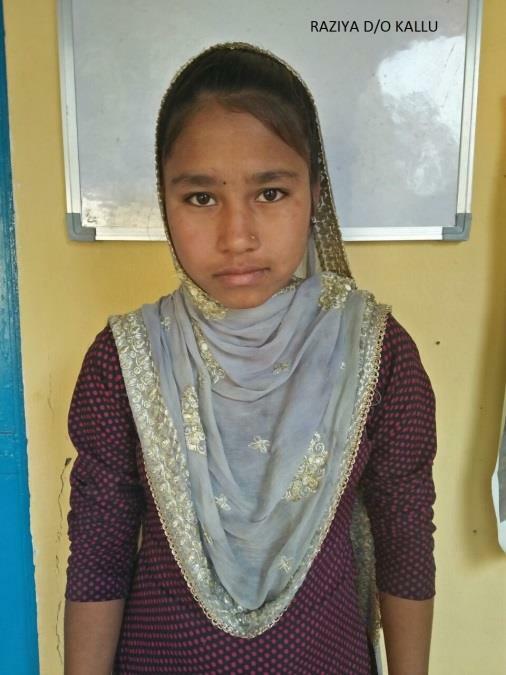 Today, Razia is studying in Class 8 and is slowly but steadily inching towards realizing her dream of becoming a teacher.